Changes the way you browse the web. This is the thing I never knew I couldn't live without! iChrome New Tab is the best new tab plugin for Chrome. Really nails a simple app that is easy to use, looks beautiful, and yet has just the right level of customizability. 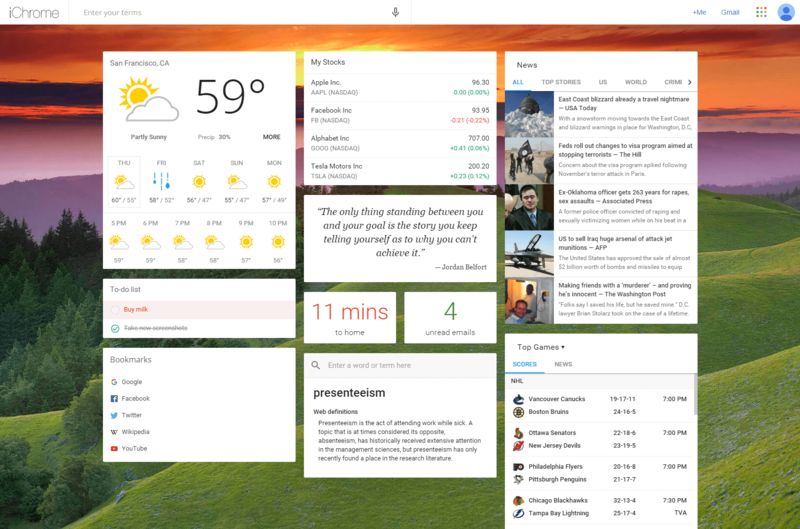 The best home page out there that ties in all your Google stuff. And just keeps getting better all the time. Keep up the good work! Quit checking the news, your stocks, the weather, how that game went last night, your stocks again, ... iChrome puts everything you use at your fingertips and updates all the time, lightning fast.